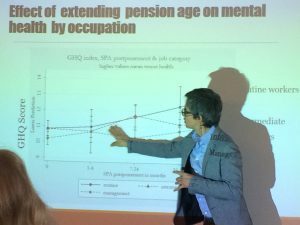 The Department of Social Work at Stockholm University will arrange a free of charge workshop titled Marketization and inequalities in health and social care for older adults ageing in place in May 14-15, 2019. Two of the keynote speakers are Marta Szebehely and Bo Burström, both part of the SIA project. PhD students are invited to present papers and those accepted will be offered free accommodation and financial travel support. For more information please contact helene.brodin@socarb.su.se. IAGG-ER (International Association of Gerontolotgy and Geriatrics European Region Congress) will be held in Gothenburg, Sweden in May 23-25, 2019. SIA will be represented by researchers participating in several symposiums. One SIA symposium is titled: Income levels, trends and changes and its impact on health in later life – a Nordic perspectiv. Chaired by Marijke Veenstra and co-chaired by Johan Fritzell. Presenters: Stefan Fors, Else Foverskov, Gitte Lindved Petersen, Marijke Veenstra and Johan Fritzell. Another SIA related symposium is chaired by Linda Enroth titled Gender and Social Inequalities in Disability-Free Life Expectancy in Later Life including presentations by SIA members Linda Enroth and Stefan Fors. Tranforming Care 2019 Conference will be held in Copenhagen 24-26 June. Many SIA related presentations are included in the program. One example is a symposium titled Implementing reablement in home care, convened by Tine Rostgaard and others. Tine is also the organizer for the whole conference. Marta Szebehely is convener, together with Ricardo Rodrigues, for a thematic panel on Transforming care work with presentation by several SIA members. Helene Brodin and Sara Erlandsson are conveners for a thematic panel on Managing care priorities in practice. During the two days senior researchers from the SIA project evalutated the progress of the project and discussed upcoming research collaborations and strategies for reaching stakeholders and end-users during the second half of the project, 2019-2020. The program included presentations from two invited speakers: Kjetil van der Wel, from OsloMet presented the work from the Nordic register research: Experiences from the C-LIFE infrastructure project and Fredric Halvorsen from the Communication Office at OsloMet, who talked about why and how research findings could be presented using a format of film. The two presentations and reports from our own research on social inequalties in ageing contributed to stimulating scientific discussions and a varity of dissimination ideas. We thank our two hostesses Marijke Venstraa and Marja Aartsen for organising the meeting and the nice dinner. 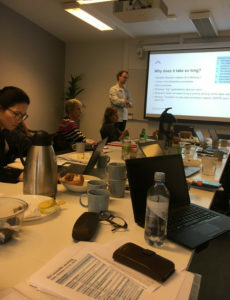 During two days, researchers from the four work packages will meet in Oslo to evaluate the progress of the project so far, and discuss upcoming research collaborations and strategies for reaching stakeholders and end-users during the second half of the project period. During May 2-4, many SIA researchers travelled to Oslo to participate in the 24th Nordic Congress of Gerontology. Several symposia and many presentations were held by SIA researchers. It was also a nice opportunity for meeting up and continuing our ongoing collaborations within SIA. Almost halfway through the Social Inequalities in Ageing programme, a conference was held to mark this mid-point. 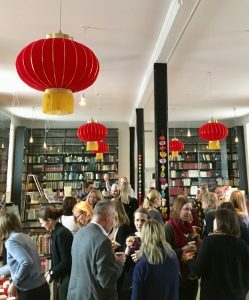 The “SIA mid-term conference” took place in Stockholm, on February 15-17, 2018. 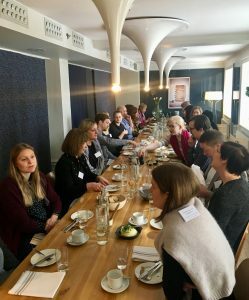 The objective was to strengthen the Nordic research on inequalities in life course influences on health, health trends among the oldest old, health care utilization, and reforms within long-term care. Both distinguished and upcoming researchers participated in the conference, presenting work they had done within the SIA-programme or on subjects relevant to the project. Hildegard Theobald from Universität Vechta, Germany, and Mauricio Avendano from King’s College, London, UK, were invited as keynote speakers. – The conference was, in my opinion, a great success. It is of utmost importance to have mid-size conferences of this type in which leading researchers and junior researchers meet and discuss crucial aspects of social inequalities of ageing, says Johan Fritzell, PI of the SIA-programme. During three days, researchers from all the Nordic countries will meet to present and discuss recent findings regarding social inequalities in aging. The full program can be found here. Nordic eldercare – weak universalism becoming weaker? 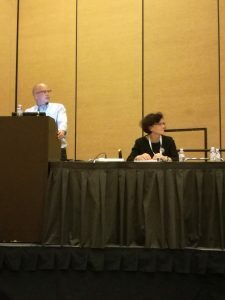 In late July (23-27), more than 6 000 participants from all corners of the world gathered in San Francisco for the 21st world congress of the International Association of Gerontology and Geriatrics, making it the biggest international meeting on aging research ever. Several SIA researchers from all Nordic countries attended the meeting, gave presentations, chaired symposiums, and attended network meetings. One symposium was specifically arranged under the SIA brand: Trends in Longevity, Health, and Functioning Among Very Old People – The Nordic Case (Chaired by Marja Jylhä and Stefan Fors). 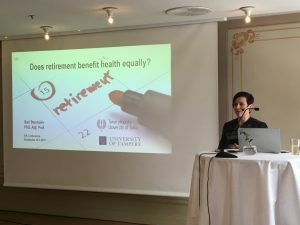 The symposium included presentations on demographic trends, health trends, health inequalities, and end-of-life care in the Nordic countries as well as a discussion with the audience. The third Transforming care conference was held in Milan in June 2017 with participation of more than 100 delegates, and quite a number of participants from the SIA project. The conference had a focus on innovation and sustainability in care policies and practices, for children, older people and people with disability. Keynote speakers were Professor August Österle, Professor Chiara Saraceno, and – from the SIA project – Professor Anneli Anttonen. The conference included also the following thematic panels: Care policy and institutional setting, Innovation and trade-offs in care services, Intergenerational care arrangements and informal care, Care work and changing care arrangements, Care policy in different care regimes. Find more information about the conference and the papers presented here, http://www.transforming-care.net/ Also note that the 4th Transforming care conference will be held in Copenhagen in June 24-26, 2019. The conference series is organized by Professor Costanzo Ranzi and Professor Tine Rostgaard. 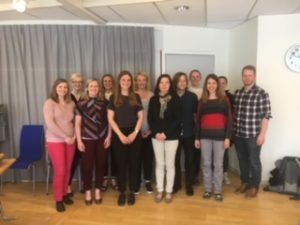 The first SIA workshop for junior researchers was organized May 22-23 in Stockholm, at the Aging Research Center. Thirteen doctoral students and postdocs from three Nordic countries participated. In addition to providing the opportunity to get to know junior researchers working within the SIA-project*, the workshop aimed to give junior researchers a chance to present and receive feedback on their work, and comment on other PhD students’ papers. For example, the SIA junior researchers presented papers on intergenerational social inequality in physical function and mortality; geographical and socioeconomic inequality in preventable hospitalizations in Denmark, Finland, and Sweden; and, the association between prolonged working life and physical functioning in old age. The first day started with a presentation of the SIA-project (Johan Fritzell), a talk about inequity in health care by Professor Bo Burström, followed by six presentations by the junior researchers. The day ended with a dinner. On day two, the presentations and discussions by the junior researchers continued and we also had the opportunity to hear Professor Marja Jylhä talk about the promises and challenges of multidisciplinary research. The workshop closed with a feedback discussion and ideas for the future. The participants were very satisfied with the workshop, and we all agreed that it should continue. The next SIA workshop is scheduled to be held in autumn 2018. Retirement for Better or Worse? 23rd Nordic Congress of Gerontology (NKG) will be held June 19-22 in Tampere, Finland. Researchers from Social Inequalities in Ageing will present their research during a symposium and with posters. Does socioeconomic position modify the effect of education to preventive home visitors on mobility limitations in older people? Socioeconomic differences in mobility impairment and psychological distress over the life course – do inequalities increase or level out? The next SIA steering group meeting will also take place in Tampere during the conferance on June 20. The SIA-project officially starts July 1st, 2015, according to the main contract with NordForsk. 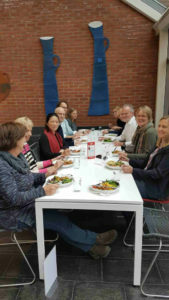 The Social Inequalities in Ageing (SIA) project was one of five project to get funded under the call for Nordic research projects on the inequitable distribution of health and welfare by NordForsk in 2015.